5+2 Bird Species Added to ABA Checklist! The murrelet split and the five full-on additions raise the ABA Area checklist to 976. Finally, the ABA Checklist Committee has done away with a “slash/combo”–the bane of every lister’s existence–on its checklist. The old Fea’s/Zino’s Petrel category is replaced with Fea’s Petrel. That results in no addition to the total number of entries on the checklist, even though it does permit listers to add a species (namely, Fea’s Petrel) to their ABA Area life lists. The ABA Checklist has been revised to reflect these and other recent changes. Click here to view the complete Checklist. The stories behind each of these seven entries are fascinating, and you are urged to read the thorough summary by committee chairpersons Jon Dunn and Dan Gibson and their colleagues on the committee. Let’s discuss these checklist changes! 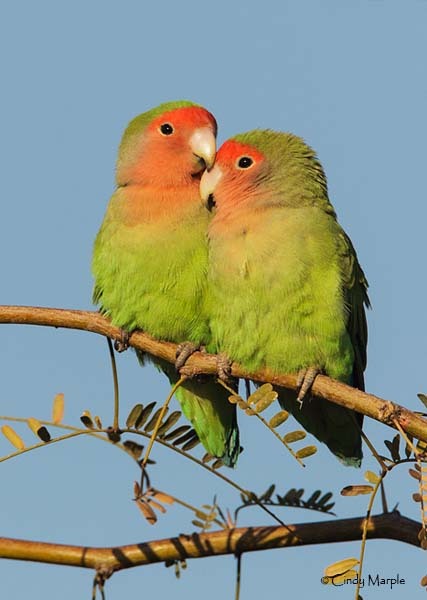 I’ll try to get the ball rolling with the two psittacids–Nanday Parakeet in Florida and Rosy-faced Lovebird in Arizona. In particular, I’d like to hear from folks who intend to go look for the birds. What are your plans? Also: Have any of you already seen these? If so, do you now add them to your life lists? Or, to count them, do you have to see them again, i.e., after the news? Photo credit: Rosy-faced Lovebirds at Gilbert Water Ranch, Arizona, by Cindy Marple. Ted Floyd is the longtime Editor of Birding magazine, and he is broadly involved in other programs and initiatives with the ABA. Ted has written 200+ magazine articles and 5 books, including How to Know the Birds (National Geographic, 2019). He is a frequent speaker at birding festivals and has served on several nonprofit boards. Join Ted at The ABA Blog for his semimonthly spot, “How to Know the Birds,” celebrating common birds and the uncommonly interesting things they do.